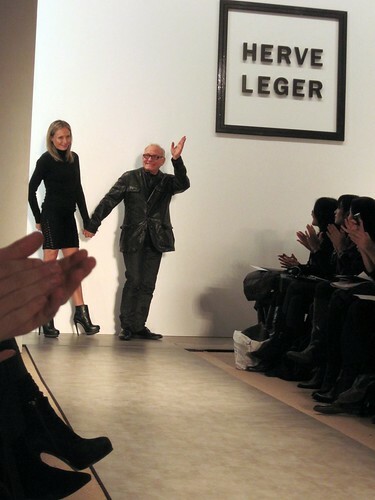 This is Part Two of my posting on Herve Leger Fall 2010 as commissioned by Harper's Bazaar and Herve Leger. I suggest reading the first post before continuing on with the second part of this journey, because Lubov Azria talks about the inspiration for the collection and how the clothes are crafted and everything, and it was more interesting for me to view the collection after hearing about the backstory. Also, I sound like the narrator from Zoombinis - "BEFORE CONTINUING ON WITH THE JOURNEY.."
BUT, speaking of Zoombinis, you know that frog game they have? And you know how frogs are similar to lizards? Well, during the show, I wrote down "sportswear lizards." See how I made that connection? Very smoothly, did I make that connection! And not only did it remind me of sportswear lizards, it reminded me of architectural jersey fabrics (which is a really lovely contrast,) and the idea of sportswear fabrics with lingerie shapes (also a nice contrast.) The classic Herve Leger bodycon shape brought these somewhat all-over-the-place references together very well. and for nightwear, added spots of neon green and pink. And the shoes! Like a more classy version of The Jimmy's jumping sneakers from that one episode of Seinfeld. This show was a reminder of why fashion shows will always be important, relevant, and irreplaceable by any technology the Internet or crazy robots in the future can think up - the details. Again, at my first post, you hear about how much work goes into making these, and to see it up close was really amazing. That combined with the energy and power that oozed out of every girl sent down the runway, and it was very special.